Harley-Davidson bikers . . . Grand Canyon river rats. . . Mormon archaeologists . . . Spelling bee prodigies . . .
For more than fifteen years, best-selling author and historian Hampton Sides has traveled widely across the continent exploring the America that lurks just behind the scrim of our mainstream culture. Reporting for Outside, The New Yorker, and NPR, among other national media, the award-winning journalist has established a reputation not only as a wry observer of the contemporary American scene but also as one of our more inventive and versatile practitioners of narrative non-fiction. In these two dozen pieces, collected here for the first time, Sides gives us a fresh, alluring, and at times startling America brimming with fascinating subcultures and bizarre characters who could live nowhere else. Following Sides, we crash the redwood retreat of an apparent cabal of fabulously powerful military-industrialists, drop in on the Indy 500 of bass fishing, and join a giant techno-rave at the lip of the Grand Canyon. We meet a diverse gallery of American visionaries— from the impossibly perky founder of Tupperware to Indian radical Russell Means to skateboarding legend Tony Hawk. We retrace the route of the historic Bataan Death March with veterans from Sides’ acclaimed WWII epic, Ghost Soldiers. Sides also examines the nation that has emerged from the ashes of September 11, recounting the harrowing journeys of three World Trade Center survivors and deciding at the last possible minute not to "embed" on the Iraqi front-lines with the U.S. Marines. Americana gives us a sparkling mosaic of our country, in all its wild and poignant charm. 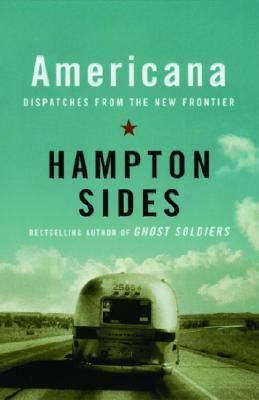 Hampton Sides is an award-winning editor of Outside and the author of the bestselling histories Hellhound on his Trial, Blood and Thunder and Ghost Soldiers. He lives in New Mexico with his wife, Anne, and their three sons.